Japanese Honeysuckle- Embrace it, Eradicate it, or Deal With it? Japanese honeysuckle (Lonicera japonica) is an evergreen, or semi-evergreen, trailing or climbing vine that was human introduced from the orient to New York State in 1806. Since that time, it has been planted for wildlife, erosion control, and as a landscape specimen. It reproduces from seed, cuttings, or layering and the vines have been recorded at lengths of up to 80 feet long. It currently is known to exist to a varying degree in every state including Hawaii, except Alaska, Oregon, Idaho, Montana, Utah, Wisconsin, Minnesota, and the Dakotas and is considered invasive in 22 of those states, 30 national parks, Puerto Rico, and American Samoa. The leaves and tender portions of the vines are an important source of browse for several species, but it’s most often noted as a highly preferred, practically year-round food source for deer, containing 9- 16% protein. The seeds are utilized by several birds including mockingbirds, wild turkey, and quail, but because of its variability in fruiting, the seeds normally only make up a minor component. Due to its vigorous growth when exposed to sunlight, and its clumping nature in the vicinity of fallen or logged tree tops, the “viney” clumps provide escape cover and food for rabbits. The nectar from the yellow to white, showy flowers is an important energy source for hummingbirds, moths, butterflies, and other pollinating insects. If you grew up in an area populated by this vine, you probably remember the trick to extract the sweet drop of nectar and may have taught your kids to do the same. Most of the interest in Japanese honeysuckle (among our readers) revolves around the fact that deer are highly attracted to its tender foliage, and it’s already present just about everywhere so it doesn’t have to be planted. Add fertilizer, and something like a cut cedar, fencerow, or some welded wire for it to climb on and you have yourself a little “deer food factory.” I arrowed my first “bow buck” about twenty years ago over a patch of fertilized honeysuckle, and twenty years later I arrowed my first buck with traditional archery equipment on the same site, except this time the deer was feasting on other naturally occurring goodies I chose to encourage (with fire) instead of honeysuckle. The debate over whether or not this plant should be embraced or discouraged will be forever ongoing because Japanese honeysuckle is here to stay regardless. I’m stuck somewhere in the middle on the debate over this species. I don’t plan on spending the rest of my weekend life trying to eradicate this plant from my property, but I don’t plan on encouraging it either. I’ve already mentioned the main “pro” associated with this plant, and considering the whitetail deer is the most popular game animal in the country, it’s a significant pro. 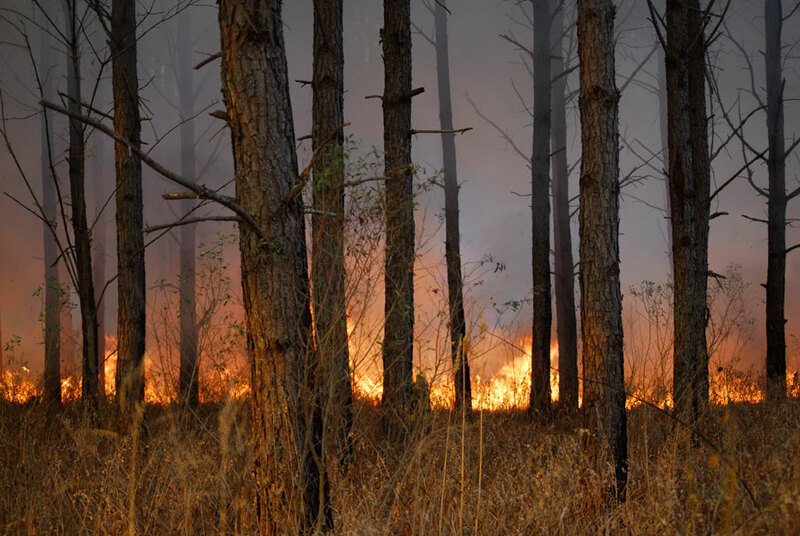 There are plenty of cons, but the main issue off the top of my head relating to forest and wildlife management has to do with the fact that it loves to devour seedling trees. If you chose to cutover 40 acres on your place last year because you had a good acorn crop the year prior, and you’d like to have a good stand of oaks come back, but you also want to fertilize tops in this area to increase honeysuckle tonnage, don’t count on a lot of oaks making it. Japanese honeysuckle loves to grab-hold of newly emerging seedlings to twine around and pull them to the ground. To get back a good stand of oaks you either need luck, plenty of advanced regeneration (sapling sized oaks) present before the site is logged, or you will need to plant trees yourself and employ herbicides, fire, more luck, or a combination of the three to get a great stand of oaks and other hardwoods to return. 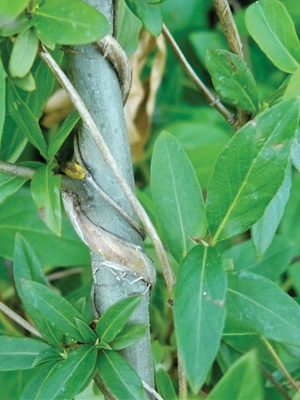 If you’re still sold on encouraging honeysuckle for your deer, and the pros outweigh the cons on your property, all you need is sunlight, structure for the vines to climb on and a nitrogen source. The fertilizer isn’t necessary, but will provide more growth. Only use a nitrogen based fertilizer such as ammonium sulfate or urea. A complete fertilizer such as 13-13-13 will encourage flowering and a seed crop, which will increase the likelihood of birds spreading the growth to other areas. 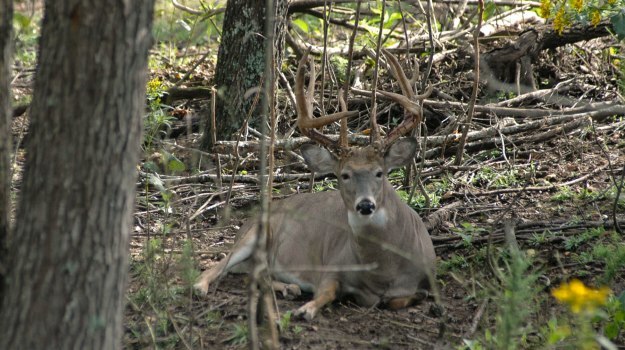 Any extra growth resulting from the fertilization will be quickly consumed by the deer, unless you have a low population. If you have a low population of deer on your property, save your money and don’t fertilize. Be respectful and don’t plant honeysuckle in areas where it doesn’t exist- period. 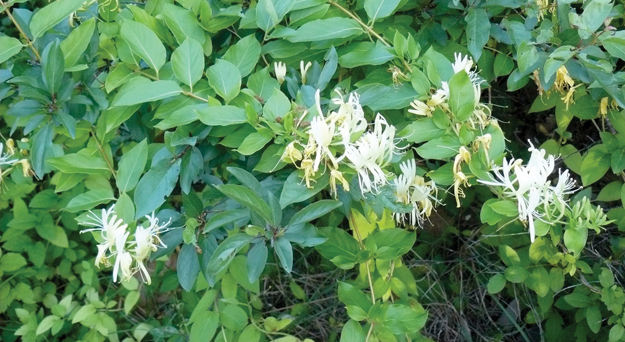 In fact, honeysuckle is against the law to propagate in several states. Don’t encourage honeysuckle if your property is located on the edge of its distribution. The good news is that there are plenty of better alternatives that deer have used for millennia before. In this scenario you probably need to take measures to control or discourage it. Don’t encourage honeysuckle near property lines unless you have discussed the idea with your neighbor. Don’t fertilize with complete fertilizers which may encourage seed development that birds can scatter. Whether you like it or not, throughout most of our country Japanese honeysuckle is here to stay. If you have in the past encouraged honeysuckle, thinking it’s the silver bullet for wildlife management, think again…the cons outweigh the pros. If you are one of those “anti non-native plant racist types” who thinks honeysuckle is going to take over the planet, you’re too late it already has. Remember, the colder temperatures that camera is exposed to, the more energy that cold weather will pull out of your batteries. I recommend the Energizer Advanced Lithium Batteries. I put these kind of batteries in my DLC Covert cameras at the beginning of deer season and don’t change the batteries until the end of deer season. Why do some people think they have the right to break the law and trespass wherever they please? 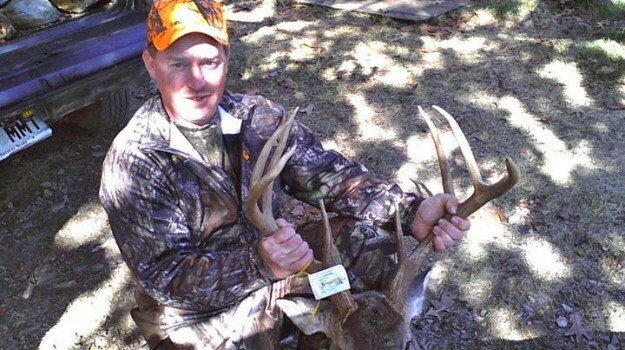 Most law-abiding property owners can’t imagine why these unethical “hunters” (for lack of a better term) would break the law and take the chance of losing their hunting privileges, or why they would steal from the property owner. Protect yourself from this and prevent trespassing and poaching from ever happening in the first place.